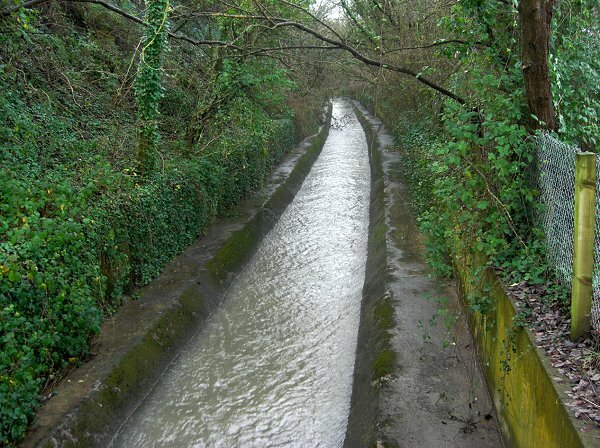 Dodham Brook has also been known as Hendford Stream and Frogg Mill Stream. Dodham Brook rises close to Larkhill Road, opposite Wessex Drive. It travels southwest then turns south after passing Thorne Gardens, it then continues running parallel to Larkhill Road, then passing between Monks Dale on the east and Shelley Close and White Mead on the west. It is culverted under Preston Road close to the Bell public house and then turns eastwards to run alongside Tithe Court and Century Park. From here it continues east, running along the northern edge of Westlands airfield, then between the back gardens of Preston Grove and Seaton Road as far as West Street. At this point it is joined by a small tributary that runs along the back gardens of the houses on the eastern side of Grove Avenue. From here it continues in a south-easterly direction, passing under Westland Road (where it is visible on both sides of Westland Road) and then running between the back gardens of Seaton Road and Beer Street. At West Hendford it passes under the road in a culvert, but may be seen from both sides of the road. From here it passes behind the western side of Horsey Lane and is then culverted under Lysander Way and Hendford Hill. At this point, until the late nineteenth century, a bridge with toll gates across it known as Hendford Bridge carried Hendford over the brook. It continues flowing to the east, passing along the northern edge of Goldenstones leisure pool and the meadow to its east. At this point the water emanating from Ninesprings joins the brook which now begins to flow in a north-easterly direction, around the foot of Summerhouse Hill. 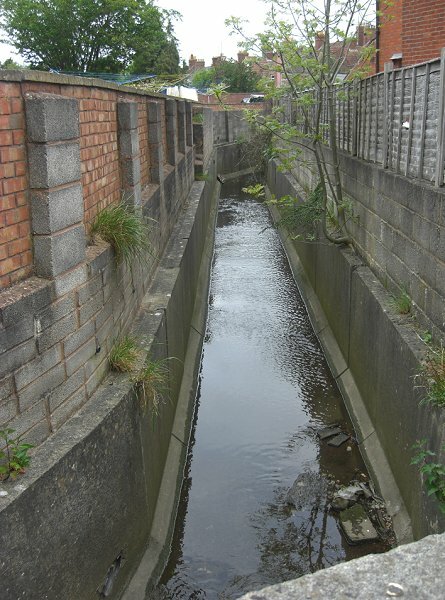 The brook passes under Newton Road in a culvert, shortly after which it joins the River Yeo. Dodham was an area of land at the bottom of Stars Lane, adjacent to Dodham Brook but on the southern slopes of Summerhouse Hill. Whether the brook took its name from the place or vice versa is not known. Plague outbreaks in the 16th century saw the development of 'Upper Doddam', an isolation hospital set up by the churchwardens in 1587 "to house poor people visited with the plague". 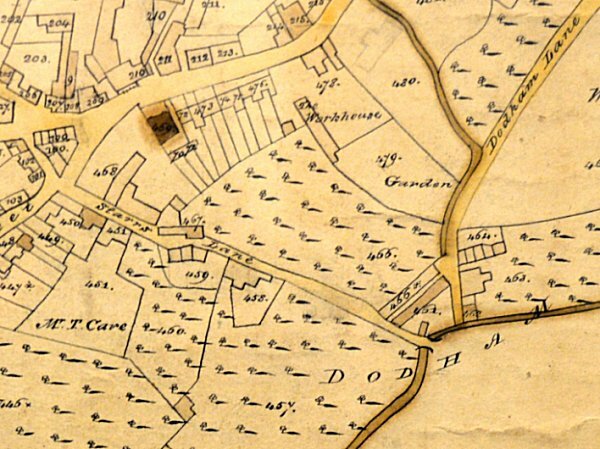 Although Watts' map of 1806 shows no buildings, the 1841 census lists Dodham and suggests it was a small enclave of poor housing that was exclusively lived in by glovers and their families. This housing, known as Dodham Cottages, Dodham Row or Newton Buildings, was on the north bank of the brook, shown on the 1831 map below, even though maps show Dodham as being on the steep south bank. 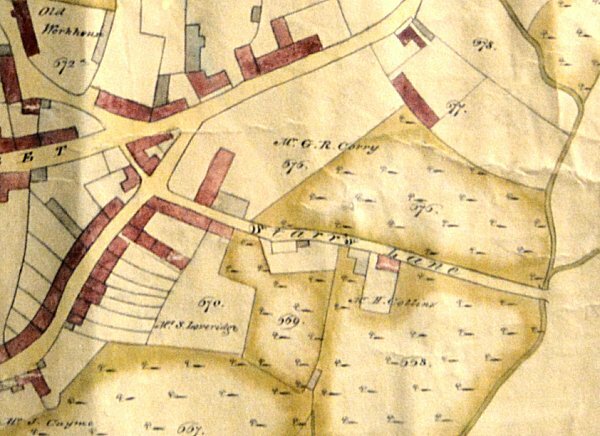 Watts' map of Yeovil of 1806 showed Stars Lane running all the way from South Street to Dodham Brook. At this point a small footbridge, Dodham Bridge, crossed the brook allowing access to Summerhouse Hill. By the time of the 1811 Ordnance Survey map, a new road had been constructed across the fields and ran from Newton Road to Dodham, called Dodham Lane and also known as Coach Lane (it was referred to as Coach Lane in an indenture of 1823 between Henry Penny and John Batten on the one part and William Snook on the other). The northern part of Dodham Lane later became today's South Western Terrace. Bidder's map of 1843 also shows the area as Dodham, in the ownership of George Harbin Esq of Newton Surmaville. 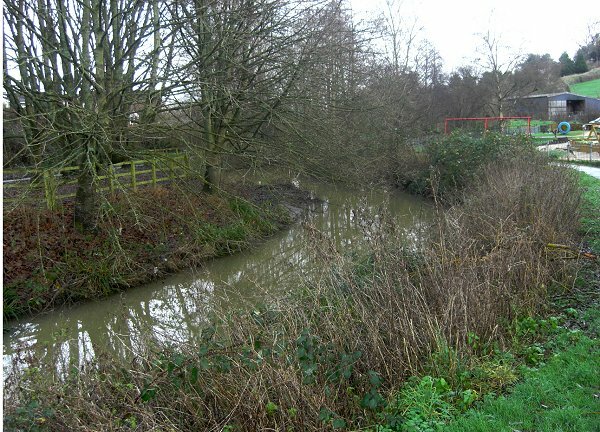 Although it does not show any buildings in the area south of the brook, there were glove factories to the immediate north of the brook in the area that is today the access road by Foundry House that leads to the Yeo Leisure Park car park. Just to the south of Dodham Lane, was a bridge called Cake Bridge where Dodham Brook passed under Newton Road. In 1845, in the London Gazette, it was reported in the great railway debate that the proposed railway line into Yeovil would "terminate at or near Cake Bridge or Newton Bridge". When the Town Station was built in 1860, Cake Bridge was demolished, Dodham Brook was diverted into a culvert under the road and the present Newton Road bridge was built for the railway (where Tec and the Car Park Inspectors have their office). There is now no sign at all of Cake Bridge. At the same time most of Dodham Lane disappeared under the new station - indeed the only part to survive was the section that became South Western Terrace, named after the London and South West Railway Company. A right of way from Newton Road to Station Road was granted to Levi Ridout, who built South Western Terrace and a new right of way was created from Station Road to Stars Lane which later became Gas House Lane. Dodham Bridge was also demolished when the railway came and a new, longer pedestrian bridge, also called Dodham Bridge, was erected across the railway. Watt's map of 1806 showing Starrs Lane running all the way to Dodham Bridge that crossed Dodham Brook. At this time Stars Lane was flanked by orchards with a few buildings near South Street and just one property, Stars Lane House, in the centre. Watt's map of 1831 showing Starrs Lane flanked both sides by orchards and running all the way to Dodham Bridge that crossed Dodham Brook in the area called Dodham - marked as such on the map. Note also Dodham Lane (built between 1806 and 1811) that ran from Newton Road to Dodham. The stream running down the right hand side of the map and then alongside part of Dodham Lane was the Milford Brook. 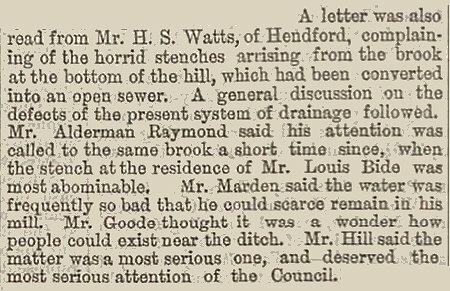 The above snippet from the Western Gazette's edition of 7 August 1868 refers to Dodham Brook close to the location of today's Goldenstones. Louis Bide lived in Brunswick House (by the entrance to the Goldenstones' car park). 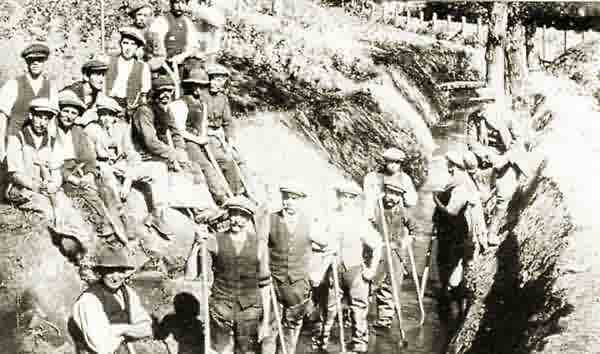 Unemployed glovers clearing out Dodham Brook in the 1930's. 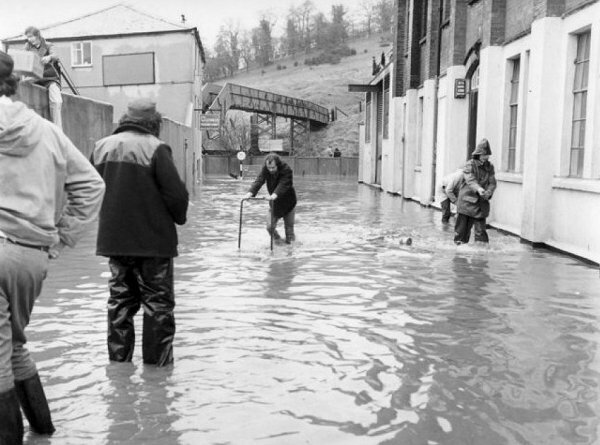 In times when the gloving industry was in recession, Yeovil Corporation employed men on useful work like flood prevention which provided alternative employment for them. 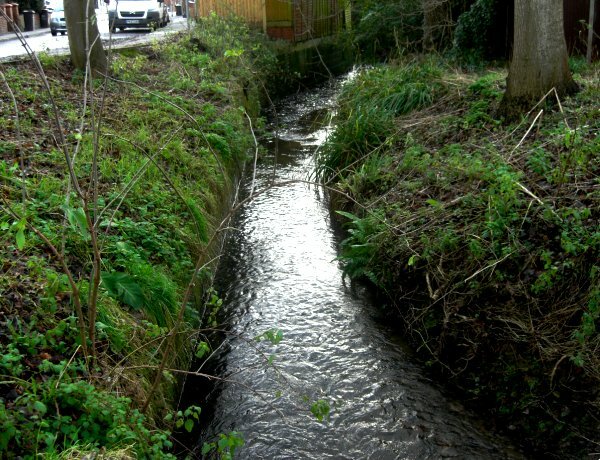 Until 1902 sewage was treated by lime precipitation at Dodham Brook and the effluent went straight into the brook. 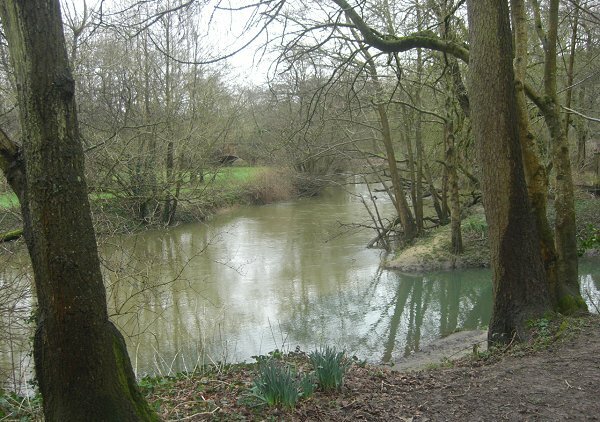 In 1897 experiments were carried out at Dodham with a small septic tank and contact beds, this proved to be successful and the system was adopted, and a new sewerage works was constructed at Pen Mill and commenced operation in 1903. 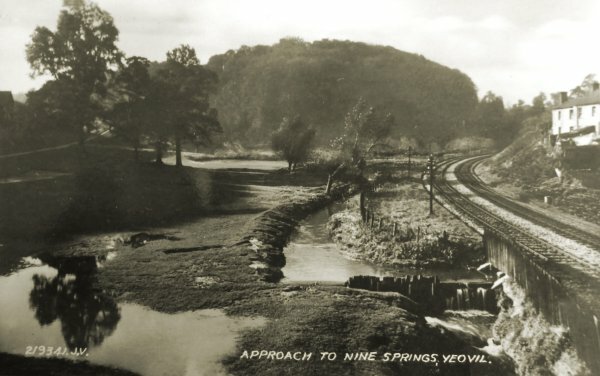 A 1950's postcard of the approach to Ninesprings with Dodham Brook and its small weir at centre and the Yeovil to Taunton railway line at right. 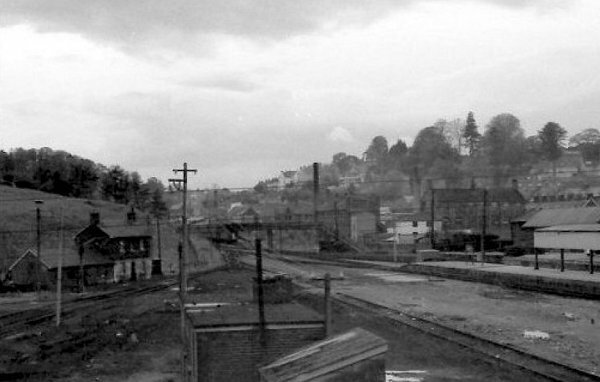 A photograph of the late 1960s looking west from Newton Road Bridge. At right is glimpsed the end of Yeovil Town Station's platform and at centre is the Dodham Bridge footbridge built to cross over the railway tracks. The area between Summerhouse Hill, seen at left in the photograph, and Foundry House, the large three-storey building at right, is the area that was called Dodham. 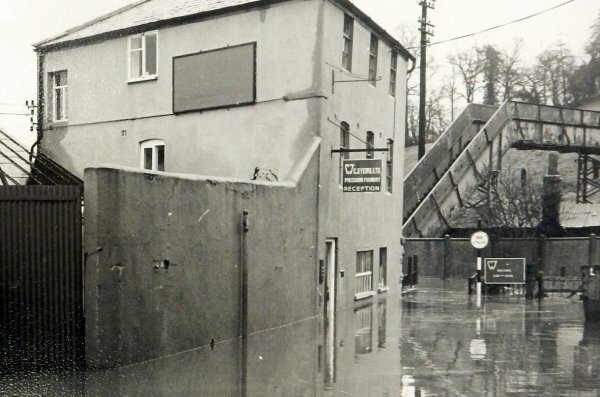 Flooding was common in the 1960s when the River Yeo would swell and the extra volume of water would back-up Dodham Brook to cause flooding as seen in this photograph of the 1960s taken at the bottom of Stars Lane. The second Dodham Bridge is seen in the background. 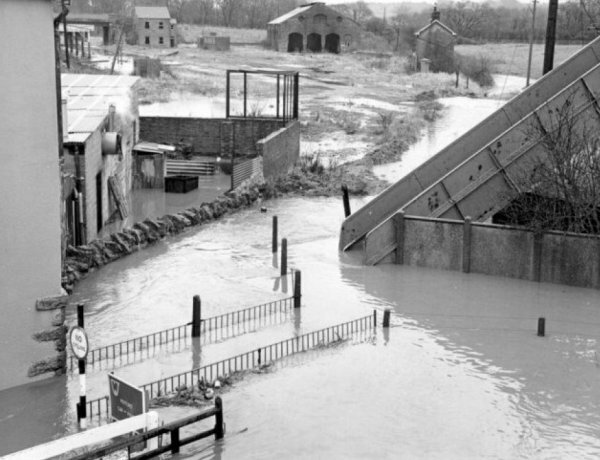 The problem of flooding was overcome by a flood alleviation scheme of the 1980s. Dodham Brook flooding at the bottom of Stars Lane. Taken at the same time as the previous photograph, this is at the foot of Dodham Bridge which crossed the railway tracks as well as Dodham Brook. A bit more water has accumulated by the time the brook reaches West Street. It has just been joined at this point by a small tributary flowing down from behind the rear gardens of Grove Avenue. Photographed in 2014. Dodham Brook is channelled behind the back gardens of Beer Street (at right). Seen from West Hendford and photographed in 2013. Seen from the southern side of West Hendford, Dodham Brook provides a quiet shelter for local wildlife. Photographed in 2013. By the time it has reached just past the meadow to the east of Goldenstones, Dodham Brook has a surprising volume of water as approaches Ninesprings. Photographed in 2014. 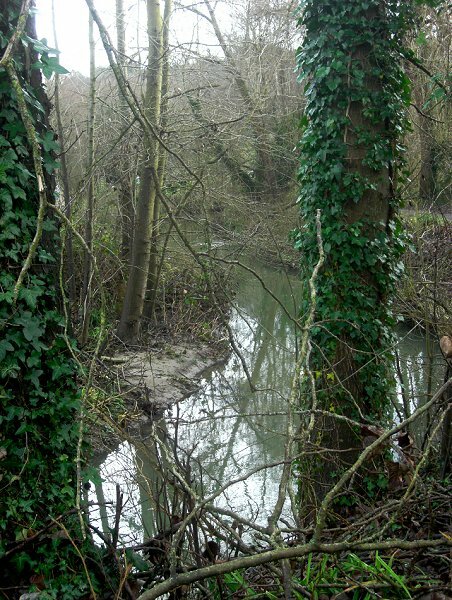 At this point, having been swelled by water from Ninesprings, the Dodham Brook passes the play area close to Addlewell. Photographed in 2014. 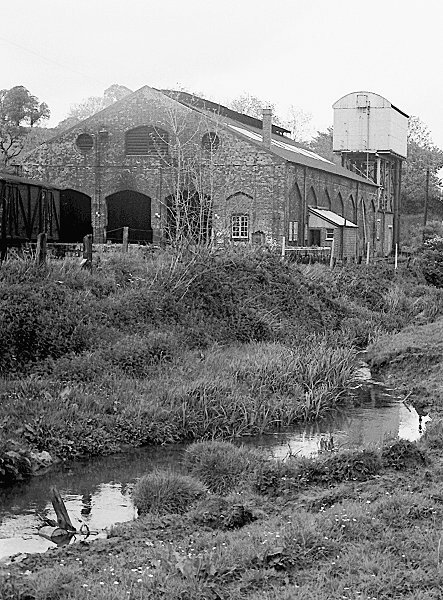 Even if you're not into railways and sheds this is a cracking evocative photo of Dodham brook before it was converted into 1977's dead straight concrete-encased flood alleviation channel seen below. This photograph dates to around 1967. 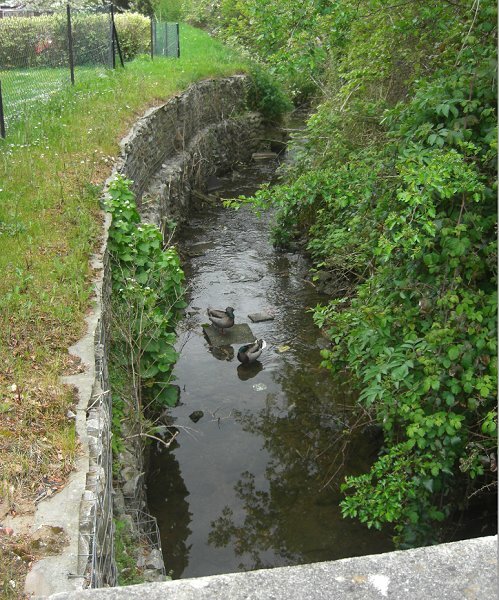 Dodham Brook flows behind Foundry House, channelled through a flood alleviation scheme. The flood relief channel was opened in 1977. Photographed in 2014. Dodham Brook, seen at lower right, joins the River Yeo. Photographed from Railway Walk, 2014. Dodham Brook used to run alongside Horsey Lane. 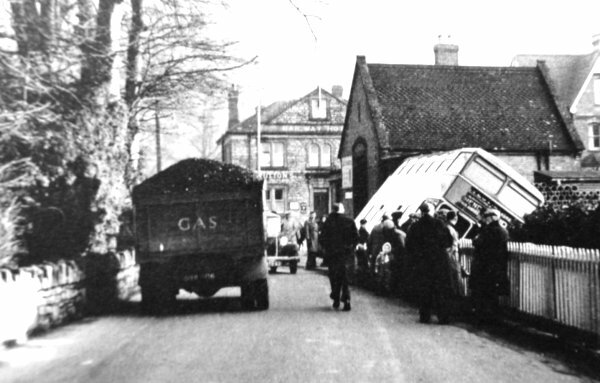 This photo shows the infamous time the bus drove into the brook in 1952. For further details and photos - see here. 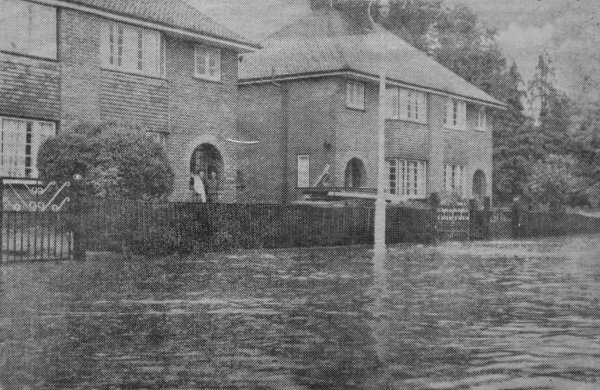 Dodham Brook broke its banks and flooded Horsey Lane on 6 August 1962 - reproduced from a newspaper clipping.